Why electricity from Russian nuclear power plants is cheaper? Compare 3.5 rupees against 6 per kWh. Experts say that the difference in the price of electricity coming from Russian and American nuclear power plants – is due to different construction strategy. One week after US President Barack Obama visited India (end of January – Ed. ), serious problems arose in terms of the India-US nuclear energy agreement. The energy produced in an American-designed NPP, will cost the consumer much more than electricity from the Kudankulam NPP, which is being built under an agreement with Russia. Multi-D® – this is an innovative technology for managing the construction of complex industrial facilities. It includes a 3D model of the project, and many other options to effectively manage the work schedule, labor and non-labor resources, as well as the construction costs of the facility. This is a universal technology, used in Russia for the construction of nuclear power plants and thermal power plants, but it can be used for the construction of any complex objects. “The estimated cost of one kilowatt-hour (kWh) of electricity, which will be produced by the nuclear power plant built in India using American designs, is about twice more than the same kWh produced in a Russian-designed nuclear power plant,” says independent nuclear energy expert Alexander Uvarov. According to preliminary calculations, the cost of one kWh of electricity from a US nuclear power plant will exceed 6 rupees. As for the electricity already coming from the first power unit of the Russian-designed Kudankulam NPP, as well as from the second unit, which will be launched later this year, according to the rate established by the regulator, a kWh will cost only 3.5 rupees. “Electricity tariffs for power coming from third and fourth units also should not be much higher,” said Sergei Dragolsky, director of the Energy Efficiency Center. According to the expert, the reason for such a big difference in price between the American and Russian NPP projects lies in a number of factors. Firstly, the Russian standard design is the result of vast accumulated experience in its construction, during which all possible cost-cutting measures were taken into consideration, and the entire project has been optimized. Secondly, the energy unit is built using the most advanced engineering technologies, including through the use of a unique system for managing complex projects – Multi-D. The Russians are building power units in India that have already demonstrated their safety and efficiency in Russia and in other countries. The American nuclear industry, which for decades has been stagnating and gradually degrading, cannot offer a real power unit to Indian partners, and is simply promoting its AP-1000 project, which exists only on paper. “In addition, during the many decades of cooperation, Moscow has proven to be a reliable partner and remains the only country actually working with India in the nuclear sphere,” noted Sergei Dragolsky, director of the Energy Efficiency Center. Kudankulam NPP meets all the post-Fukushima safety requirements. Its safety system was designed taking into account possible earthquakes, tsunamis, loss of power and water. With the maximum number of combinations, of redundancy of active and passive systems, of safety measures, make the Kudankulam NPP the only station outside of Russia that contains a system of passive heat removal using airflow, eliminating the possibility of a Fukushima scenario developing in this plant. 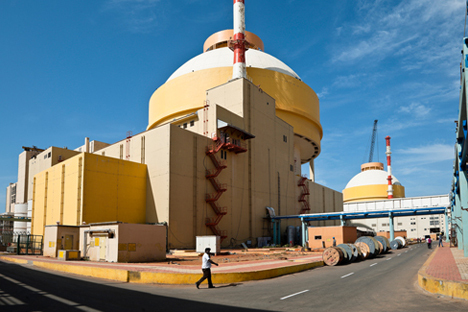 At the very end of 2014, the first unit of Kudankulam NPP in the state of Tamil Nadu started operating in the warranty mode. “Despite its relatively young history, the Kudankulam-1 has already achieved several key milestones. In October 2013, it was for the first time connected to the energy grid. In January 2014, the testing program was successfully completed at a power setting of 50%, in June – 75% and 100%, i.e., the unit had proven its ability to produce as much electricity as the design capacity of the project. Electricity from the Kudankulam NPP goes to the states of Tamil Nadu, Kerala, Andhra Pradesh, Karnataka, and Union Territory of Puducherry,” explains Valery Limarenko, president of the united nuclear engineering company NIAEP-ASE. Since its first synchronization with the network, the energy unit has worked a total of 4,700 hours. During this time, India received more than 2.8 billion kWh of electricity. At the end of December last year, during the visit of Russian government leaders to India, a number of agreements were signed to provide the legislative basis for future cooperation. In particular, documents were signed for the construction of the second phase of Kudankulam NPP as well as a “road map” for the construction of at least 12 units during the next 20 years. The partners agreed on exploring the necessary steps in the development of the nuclear fuel cycle, including the exploration for, and production of uranium, nuclear fuel, radioactive waste and spent nuclear fuel. In addition, Russia and India signed a contract for the supply of the main equipment for the third and fourth reactors of the Kudankulam NPP.